Glasgow: The first female amputee to climb Mount Everest has been made an honorary Doctor of the University of Strathclyde. Arunima Sinha, received the honour at a graduation ceremony in Glasgow on 6 November in the Barony Hall, in recognition of her inspirational achievements in mountaineering. The award also recognises her charitable work through the Arunima Foundation, which seeks to empower women, disabled people and generally improve the health and social and economic situation for poorer communities. A former Indian national volleyball player, Ms Sinha had her left leg amputated below the knee after being thrown from a train while resisting a robbery. While recovering she resolved to climb Mount Everest and later trained with Bachendri Pal, the first Indian women to climb the world’s highest peak. After reaching the top of Everest on 21 May 2013, and becoming both the first female amputee and first Indian amputee to climb the mountain, Ms Sinha has gone on to be the first female amputee to climb the tallest mountains in Africa, Europe, Australia and South America. In 2015, she was presented with the Padma Shri, India’s fourth-highest civilian award. 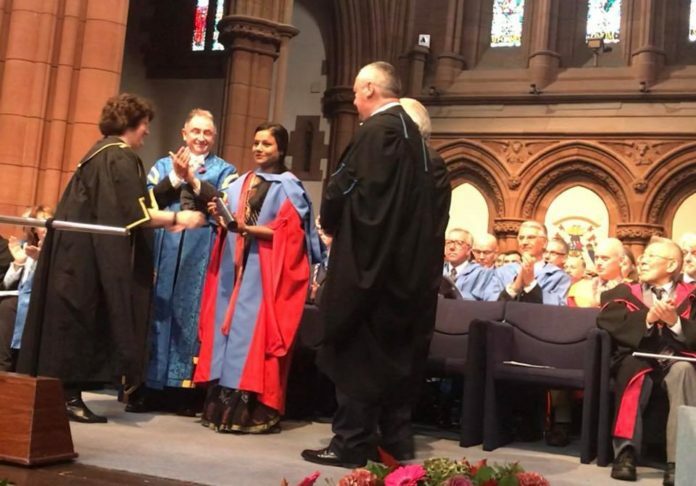 Professor Sir Jim McDonald, Principal and Vice-Chancellor of the University of Strathclyde said: “Arunima is an inspiration to amputees around the world. Not only has she shown real spirit, courage and determination in overcoming adversity, she is using her compassion and positivity to help other people. Ms Sinha joins a global community of more than 170,000 Strathclyde alumni, of whom more than a quarter are based overseas.